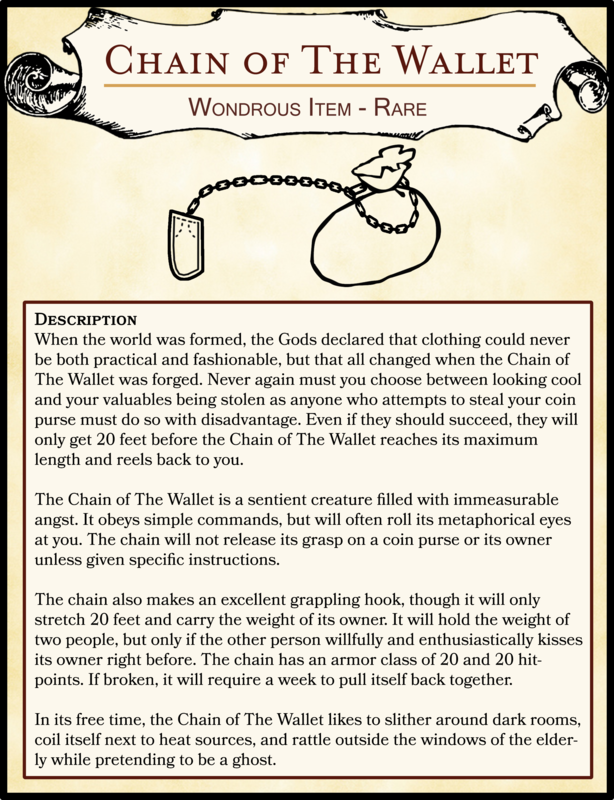 When the world was formed, the Gods declared that clothing could never be both practical and fashionable, but that all changed when the Chain of The Wallet was forged. Never again must you choose between looking cool and your valuables being stolen as anyone who attempts to steal your coin purse must do so with disadvantage. Even if they should succeed, they will only get 20 feet before the Chain of The Wallet reaches its maximum length and reels back to you. The Chain of The Wallet is a sentient creature filled with immeasurable angst. It obeys simple commands, but will often roll its metaphorical eyes at you. The chain will not release its grasp on a coin purse or its owner unless given specific instructions. The chain also makes an excellent grappling hook, though it will only stretch 20 feet and carry the weight of its owner. It will hold the weight of two people, but only if the other person willfully and enthusiastically kisses its owner right before. The chain has an armor class of 20 and 20 hitpoints. If broken, it will require a week to pull itself back together. In its free time, the Chain of The Wallet likes to slither around dark rooms, coil itself next to heat sources, and rattle outside the windows of the elderly while pretending to be a ghost.